Did you ever throw random ingredients in a dish, toss it in the oven, and hope for the best? That's what I did yesterday. I was grabbing some potatoes to bake and came across some beautiful beets I had purchased at my last farmer's market run. I figured I could just throw them in the oven while the potatoes were cooking. But, I only cooked with beets a few times without much success. I usually juice them or eat them raw in salads. But, then my mind started spinning. Hmm...how about tangy cranberries, some citrus flavor, and a touch of cinnamon? So, I began peeling and chopping the beets. They are a bit messy! The color does wash off your hands but try not to get it on your clothes. 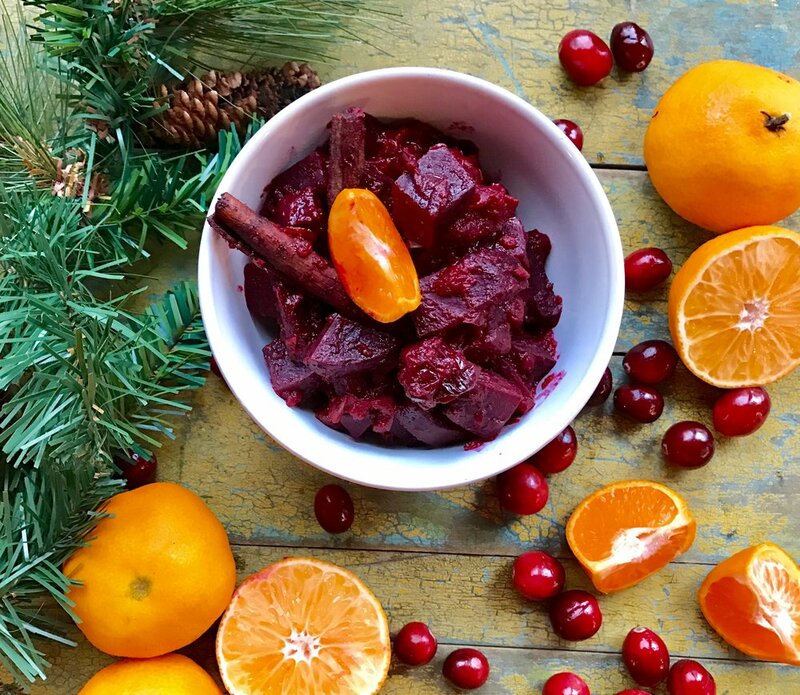 I tossed them in a casserole dish, added fresh cranberries, clementines, chopped apples, cinnamon, ginger, a touch of date sugar, a little water, covered it up, set the timer, and hoped for the best. I was doing some holiday decorating and went outside to put up the lights and when I came back in the house smelled absolutely amazing! I thought even if it didn't taste good the smell was delicious. After about an hour of cooking the beets were finally tender. I was excited and worried. Would it taste as good as it smelled. Well... I LOVED it!! The apples, clementines, and cranberries cooked up into this wonderfully amazing sauce that coated the beets just perfectly! I couldn't stop eating it! It surprisingly went well with the baked potato and Avocado Rueben that I was having for dinner. Sometimes when you least expect something to taste good it surprises you! I ate almost half the casserole myself. Try this recipe when you're having guests over so the delicious smell can fill your house with a warm holiday vibe. Plus, they just may enjoy it! Beets not only taste good but they are rich in a variety of essential vitamins and minerals, making them an excellent addition to your diet. The beet benefits to your health are impressive and somewhat surprising too when you consider their widespread positive attributes such as their ability to help with exercise performance, to ward off cancer, and to help purify the blood too. Beets naturally contain nitrates. The type of nitrates found in whole foods like beets is actually very beneficial for boosting energy and performance. I ate the rest for lunch the next day and went on a six-mile hike in the woods without getting tired. Maybe it was the beets! So make beets a regular part of your diet. You can bake, juice, or eat them raw. Any way you slice them they're delicious and you'll receive lots of healthy benefits. Place all ingredients in large casserole dish, mix well, cover, and place in preheated oven. After 30 minutes stir, cover, and return to oven. Cook 30 minutes more or until beets are tender. Stir well, squeeze additional juice from a clementine on top, and serve warm.